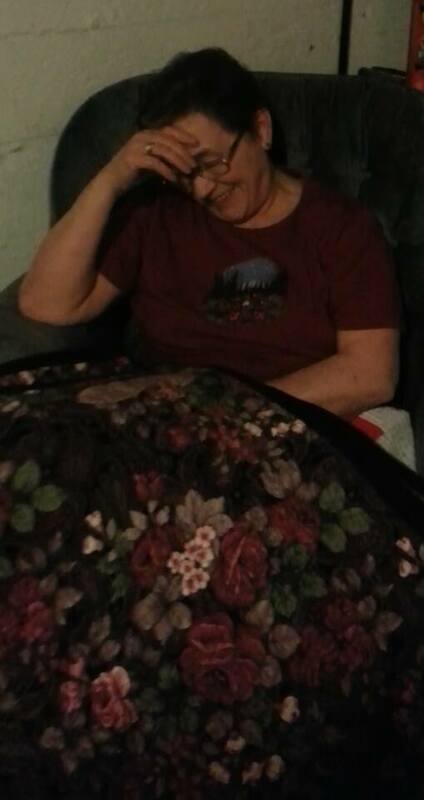 Quilt show purchase brings my mom to tears. Having all these Posey blocks I had to figure out how to get them into a quilt… I did exactly that at our local quilt retreat that fall I started making the blocks to make the quilt. I had already purchased black, green and pink fabrics to coordinate ( I say coordinate as I’ve been corrected that the word match should not be used) with the material. I got most of the top done that weekend. Of course there was some time I just had to walk away. That’s about the time when you keep repeating mistakes. Well I got my top done and its got sandwiched so the quilting was pretty simple to figure what I was going to do as I just copied the paisleys in the fabric and did fancier paisleys with colored thread in my large blank areas. I like to add a piped binding to my quilts as it gives just a zing of color to the border. I was using the Ricky Tims method but since then I have found that the magic binding technique is much easier and quicker. So with the quilt now finished what was I going to do with it. .Hey why not give it to Mom. so here comes the label. It had to be special. This is what brought tears to mom when she read it. I gave it to her for Christmas that year we went to the quilt show… a memory that we shall always cherish. I know she loved it as she has been hauling it all over the country showing anyone who wants to see it. Well enough of the sneaks peeks here is what the quilt looks like. Previous Ambitious paper piece project for 2nd round. What a lovely story of working together on a project, and a great gift for your mom!